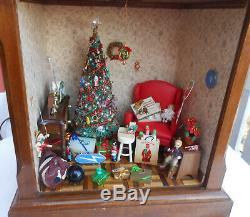 DIORAMA CHRISTMAS PARLOR MINIATURE ROOM TREE LIGHTED DOLLHOUSE VINTAGE OOAK 38 PC. 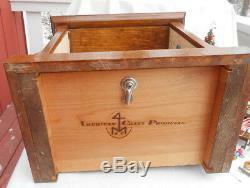 Listing is for over 38 pieces!! These stunning pieces have wonderful detail. There is a electric light hanging from the ceiling that looks real. 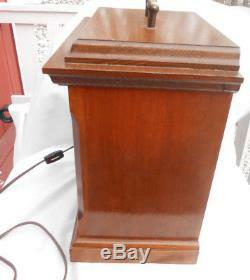 B ox is 10 1/2" long x 6 3/4" deep x 12 tall including handle. The front glass window slides out for access to the room. Framed with glass to protect all the great furnishings in the Christmas Room!! 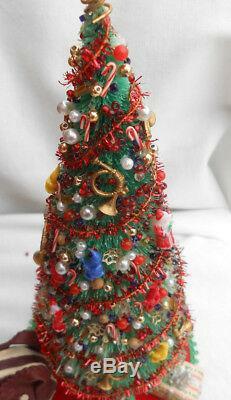 Special feature is a Christmas Tree loaded with ornaments. I have hot glued all the pieces in place. This alone took hours of work. 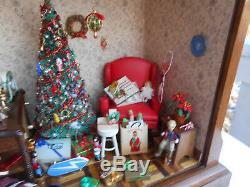 This handmade Christmas room would make a wonderful addition to any collection. It has over 80 individual miniatures, which you know can be pretty expensive, especially the real old ones. The christmas tree alone is worth quite a bit. There were many, many hours of work and unbelievable attention to detail that went into this great conversation piece. 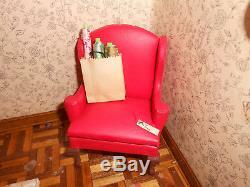 For the most part considering age, the items are in good to excellent condition. Included in Christmas Parlor Room. Christmas tree loaded with ornaments - french horns, miniature candy canes, santa claus, star, garland, beads, elves, man playing a accordion lots of detail for a tiny 7 1/4 tree. Felt tree skirt with green trim. 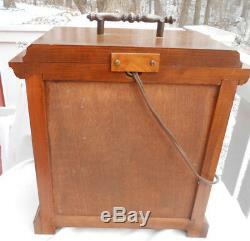 Wood sofa table with pullout drawer. 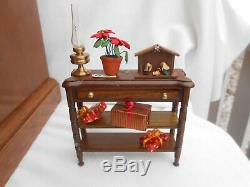 Nativity set with creche - Box with ribbon roll. Oil lamp with glass chimney. Bowling bag - Plate on the wall. Black bowling bowl - Drummer boy. Mantel clock - Christmas wreath on the wall. Wood stepping stool (that works). Christmas stocking with gingerbread man, candy cane etc inside sock. Fishing rod - Opened present. Wood stool - Donald duck. Miniature doll with cloth clothes & hair. Bag holding 3 roles of wrapping paper. Hanging light fixture (works with electricity). Comes from smoke free home. A work of art, can be all yours because there is no other like it anywhere. This was handmade by a 80 year old woman!!! 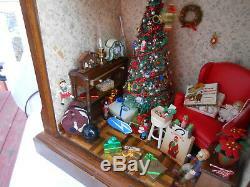 A complete Christmas parlor has been frozen in time, and shrunk!! Don't let this one slip away. Thank you for looking and good luck. 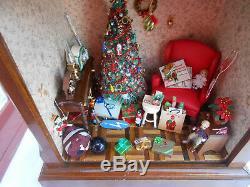 The item "DIORAMA CHRISTMAS PALOR MINIATURE ROOM TREE LIGHTED DOLLHOUSE VINTAGE OOAK 38 PC" is in sale since Monday, December 11, 2017. 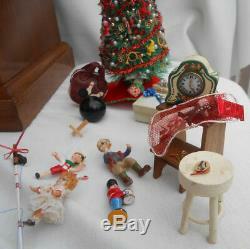 This item is in the category "Dolls & Bears\Dollhouse Miniatures\Artist Offerings"." and is located in Burlington, Wisconsin. This item can be shipped worldwide.